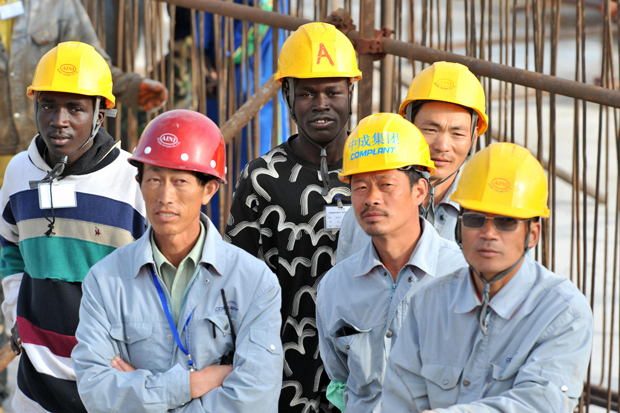 Senegalese and Chinese workers observe a ceremony at the national theater construction site financed by China on February 14, 2009 in Dakar, during a visit by Chinese President Hu Jintao and Senegalese President Abdoulaye Wade. China may be sincere in its belief that its engagement in Africa is not neo-colonial or imperial in nature but author Howard French argues that may be what ultimately happens if Beijing continues on its current path. In his provocative new book, China's Second Continent, French travels across the continent to survey Chinese and African opinions about the PRC's expansive embrace of Africa. What he discovers offers both hope and concern for the future of the Chinese in Africa.